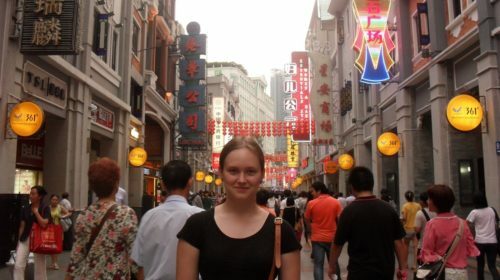 In the fourth installment of our Lessons in Learning Chinese series, we interviewed Sara Jaaksola of Living A Dream In China. Sara has been a Chinese learner for as far back as her middle school days. What started as an interest, has developed into a full-on passion that has led her to where she is now – living in China while she works on her undergrad in Chinese. At her blog, Sara does more than just journal about her life (which, by the way, is interesting as well!) – she shares her experiences living and learning in Chinese, records her progress, offers some great advice, and even blogs in Chinese. Definitely check it out. For now, we sat down (figuratively of course) with Sara and asked her to go into some detail. Enjoy! Do you have a specific approach or style as to how you go about studying Chinese? I’m currently working on a Chinese as a Foreign Language undergraduate degree at Sun Yat-Sen University in Guangzhou, so most of my studying is formal lessons and doing homework. I’m on my third year and will graduate at the beginning of 2014. For these two last years I chose a specialization in teaching Chinese, and my courses are divided between general language study and teaching Chinese special courses. Besides sitting on formal classes I also watch Chinese television and read Chinese novels. Chinese language isn’t just a major for me, it’s a language that I use to live my life here in Guangzhou. Mandarin is a lingua franca for my Cantonese boyfriend and I. What motivates you to continue studying Chinese and deepening your understanding of the language? I started studying Chinese because of pure interest in the language, culture, and history of China. The first time I heard Chinese being spoken was before I was born as my parents lived in Beijing when my mother was expecting me. I was born in Finland and started learning simple Chinese by myself when I was in middle school. Only when I attended university did I start to take lessons and two years after I made my childhood dream come true and moved to China. My reasons to continue studying Chinese are still the same. It’s such a fascinating language which with I feel a deep connection. I need to study Chinese in order to be me. It’s not always that fun to change your hobby into a major, but it’s still worth it. Do you have any learning techniques or methods that you’ve found particularly useful and/or effective along the way? My listening skills I owe to Chinese dating shows (非诚勿扰, 我们约会吧) and dramas like 裸婚时代, 幸福三颗星 and 夫妻那些事. I’m convinced that watching these shows is the reason why my listening section got the highest score in the HSK exam. My spoken Chinese on the other hand is thanks to my local boyfriend. I only started to really speak Mandarin after I met him and was happily forced to use Chinese everyday for hours. I don’t recommend anyone get a boyfriend or girlfriend just for language practice, but having one really helps! Recently I’ve started to write posts in Chinese on my blog once a week and have gotten amazing help from my readers. Occasionally I also record my Mandarin (or Cantonese) and let others spot my mistakes and correct my pronunciation. What tools have you found the most useful in your studies/experience learning the language? When I started learning I used a lot of ChinesePod for listening practice, but as soon as you can, start listening to native material by watching television dramas, movies or listen to the radio. For studying vocabulary I use Skritter to memorize words and practice writing characters. Then I use Jukuu for example sentences in order to learn how to use all that vocabulary in my textbooks. Any funny stories, memorable moments, or particularly interesting experiences you’ve had along the way? These situations feels like losing face, but on the other hand, sometimes Chinese people don’t understand other Chinese people. I’m not sure if it’s comforting, or makes learning Chinese sound like an even a bigger task. If Chinese people can’t understand each other, then how are my chances? I think the word 麻烦 (má fán) is great and really hard to translate to English or Finnish. That word just seems to include so much meaning and there sure are many 麻烦 moment while living in China. What my local boyfriend thinks is funny when I say 有木有 (yǒu mù yǒu) rather than 有没有 (yǒu méi yǒu) because he has never heard a foreigner use that piece of slang before. There are so many slang expressions to learn, and especially when I live in Guangzhou, many of them come from Cantonese. Finally, what would you say to our readers as to what they could do TODAY to go out and improve their Chinese? Well, you can do this indoors too, but open a Weibo account, QQ account, and start a Chinese blog. These are all great ways to connect with native speakers no matter where you live. No matter how little or how much Chinese you know, the key is to use your language skills as often as possible, in ways that you enjoy. For more info on Sara, Chinese language study advice, and just an all-around good read, check out Sara’s blog, Living A Dream In China. Lovely interview – I am really enjoying this series and was also hoping you would feature a woman soon. Even though I didn’t comment over there, I also enjoyed the post with the Sinoglot guy as I find that blog fascinating. Sara, I actually just found your blog the other day and have been enjoying reading it. Is nice to see a week-by-week progress of a regular person. I hope you continue and I look forward to following your success. So nice to get your comment and hear that you like my blog Anne. Having feedback like this inspires me to continue to write my blog and study more Chinese. Thanks for the solid tips Sarah! I have read your blog sometime back and I thought your post on Chinese’s view of foreigners as rich people is quite true. I guess that also goes for other developing countries. Going back to the language, I’m just curious, are you moving back to Finland after you graduate to teach Mandarin? Nice to hear you liked the interview Alan! Actually I’m hoping to stay in China after graduation and maybe the most favorable option would be to stay in Guangzhou. It already feels like home and it would be hard to leave. I’m planning on doing my own business after graduation and teaching could be a small part of it, in general I would offer different kind of services for Finnish/foreign tourists, expats and business men. Good job Sara, what an awesome post!I am fascinated in this topic and your success is definitely inspirational. I think watching dating shows and dramas definitely contribute a big part of your success, and I’ve done so much research and seen countless examples using “listening first” approach, and achieve fluency much faster than average user. Listening is always the first part of learning a language, sooner or later I am sure your speaking would come after, it’s just a matter of time you will achieve Chinese fluency, as long as you keep using listening as your priority of learning Chinese. And you’re enjoying Chinese- not just the language itself, also the culture and history, most people neglect that, but you’ve got them covered, which almost gurantee your success. I think learning the culture of that language is extremely important as well, and it can boost up your efficiency of learning that language as well as you IMMERSE in that language. I’ve created a website about <a href="http://effortless-chinese.com"how to speak Chinese effortlessly and automatically, I think we should exchange some idea on this topic. I do think that Chinese TV is the reason my listening skills might be my stronges skill at the moment. I also help that by watching more Chinese dramas it will help with my spoken Chinese as well, as I get good examples how Chinese is used by people my age in real life. Hauska törmätä sinuun Sara näin yllättäen. Very nice interview of a fellow skritterer.